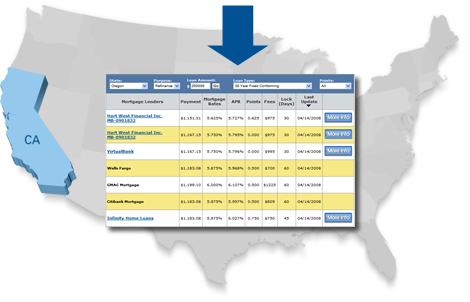 ERATE® provides this page to help consumers locate mortgage lenders covering Stockton. While our goal is to provide an extensive network of lenders and brokers throughout Stockton to make your life easier and get you the best financing we are not responsible for the performance of such lenders. Whenever selecting a mortgage lender be sure to do your own due diligence. We are committed to provide you with the best rates for all kinds of mortgage loans. Our super fast and extremely friendly customer service are our highlights. Apex Financial group Inc has been helping several people in California get the best finances and the best homes. Even if you are a home owner looking to tap the equity in your home, look no further. Central Valley Mortgage is one of the best mortgage companies with a wide range of loan programs which include: purchase, refinance, debt consolidation, home equity loans, second mortgages, construction loans, and home improvement loans tailored to your unique situation. Ctx Mortgage is committed to serving our customers with top quality customer service. For us it is always the customer first and we utilize all our skills to help them get the best rates. We are proud to announce that we are one of the best mortgage companies in California with a team of professionals as good as they come. JMP Financial group provides programs with plethora of options for both people with excellent credit as well as people with less than perfect credit. Our rates are also most competitive. Mortgage solutions network has ensured that mortgages are looked upon differently now. We do not treat mortgages as mere loans. We consider them to be tools with great benefits for the borrower. Pacific Mortgage is a full service mortgage company with the most diverse product range ever. We have evolved with times and now use the most advanced technology since its inception. Temple Inland Mortgage Corp. absorbs all the complexity in the loan process making it as simple as filling out a few forms. Yes, now that's all that we need to lend you the best loans. Valley Mortgage and Realty Ctr service is unlike other banks who might try to force a loan on you. We make sure that the loan is custom designed to suit you and your needs. To find the best mortgage rates and the best lender in Stockton, California you need an expert source. ERATE provides an extensive network of lenders and brokers throughout Stockton to make your life easier and get you the best financing. Stockton, California is an inland city in California's "Central Valley" that is 90 minutes west of San Francisco, and 50 minutes south of Sacramento, California's capital. It is the county seat of San Joaquin County and the fourth largest inland city in California (after Fresno, Sacramento, and Bakersfield). It is also the thirteenth largest city in California. Stockton is a two-time winner of the prestigious "All America City" award presented by the National Civic League (in 1999 and 2004). Stockton's weather is characterized by hot summers (the average daily temperature in July is in the nineties), and mild winters (average daily temperature in January is in the mid fifties). Stockton receives about fourteen inches of precipitation a year. Stockton was a a transit point for miners heading north to "gold country" during the California gold rush. It was founded in 1849 and is named after Commodore Robert F. Stockton. Stockton was incorporated 1850. One of the major drivers of Stockton's economy is agriculture. San Joaquin County, in which Stockton is located, is the fifth largest agricultural county in the United States. Another major driver of Stockton's economy is shipping and transportation. Stockton is home to California's largest inland seaport - The Port of Stockton. Other industries in Stockton include: aerospace, automotive products, and building products. Stockton is also home to several professional sports teams. The Stockton Ports are a Class A Advanced Minor League Baseball (MiLB) team affiliated with the Oakland Athletics. The Stockton Lightning are a minor league arena football team in the Arena Football League's minor league (the AF2). Also playing in Stockton are the Stockton Thunder, an ice hockey team playing in the ECHL, and the California Cougars, an indoor soccer team playing in the Major Indoor Soccer League (MISL). About the author: This article was written by Rob Pirozzi, a staff writer for City Town Info and writer of numerous mortgage articles.